is paris always a good idea? : italian girl stir-fry. I don't know about you guys but winter to me means eating carbs, lots of carbs, preferably Italian carbs. These frozen bones need some padding, and a crispy garden tossed salad in a light vinaigrette simply won't cut it. Unfortunately. Wanting to avoid the April freak-out when I realize that my arms are chunking out of my cap sleeve spring dresses and my knees look doughy (I wish someone would have told me that after 30, even your knees gain weight! ), I needed a way to cheat the system a bit. What could I chow down on that would be filling and comforting, yet won't reside rent-free on my hips for the next few months? Foie gras. Out. Heavy meats. Out. Lasagna. Sad to say it: out! I actually figured out a way to trick my brain into believing that I ate a steaming bowl of delicious pasta...sans pasta. This is a little something that I call the Italian Girl Stir-Fry. I generally don't do recipe posts, but this cheat is too good (and too easy) to not share with you on this icy weekend in January. 4. Trickle olive oil in a large sauce pan on medium heat and saute the garlic for about a minute. I use my own infused garlic and basil extra virgin olive oil. It gives it that mamma mia kick but it's not required. 5. Toss in onions and cook until golden. until all the leaves are wilted. 7. 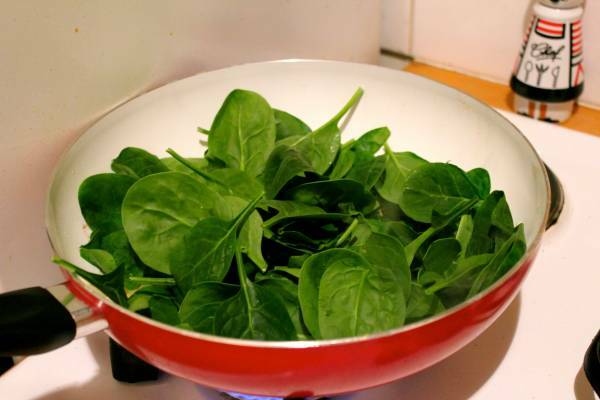 Distribute tomato sauce evenly over spinach. It's not the most attractive dish, I know, but the taste makes up for its sloppy presentation. Also, you can add whatever veggies tickles your fancy; mushrooms, peppers, fresh tomatoes, or sub out the tomato sauce for an artichoke-based pesto (which I tried yesterday - delishville)...the options are endless! This has been my go-to recipe during these past few cold weeks that has kept me full and fueled. Now that the pasta cheat is tried-and-true, any suggestions on how to cheat my latest love, raclette? Test it out and tell me what you think! As a chambre de bonne alumni, I promise that your kitchen will be able to handle it! Just make sure you have a wide enough pot because the spinach is super fluffy before it cooks down and my leaves kept falling out and burning on the flames. Yummeeee. I will be making this and my thighs will thank you for it. Please do and tell me what you think and if you've come up with some creative additions to throw in the pot! No cimo! Why is it so hard to find here? I thought it was just a Paris thing but I guess it's hard to find everywhere in the country. I guess I'll JUST HAVE to go to Italy! Thanks for keeping your eyes peeled for me. Ella, I finally made this today and you are my new hero because I LOVE it. It is one of those things that I wonder WHY didn't I think to make this before? I didn't try with the chicken and chou romanesco (though will another time) but just put fried egg on top and THAT, my friend, was perrrrfect. Let me know what you think of it! Have a lovely Sunday! Sounds yummy, although don't know if it will fool my pasta receptors... Have seriously been living off cannellini bean soup recently - soften garlic and lemon zest in olive oil, add beans, stock (chicken or vege), lemon juice and rosemary, simmer for a bit, blend and serve - v yummy, warming and filling! I thought the same thing, how could spinach possibly replace the taste of a bowl of pasta? Impossible, I declared! But it did. I eat this a few times a week now. I'm completely hooked. Cannellini bean soup! Delish!!! I'll check out your recipe next week when we go grocery shopping! Thanks Gwan! Thanks Katy! That's a great suggestion! I've heard of this swap out with lasagna. I'm missing a lot of kitchen necessities like a deep and wide pan to bake lasagnas in. Once I'm fully equipped, I'll give this a whirl! This looks and sounds delish! You had my mouth watering at 7am. I even asked husband to pick up some Spinach after work:) I know what our dinner is going to be tonight! I've been using spinach or arugula in place of pasta forever. 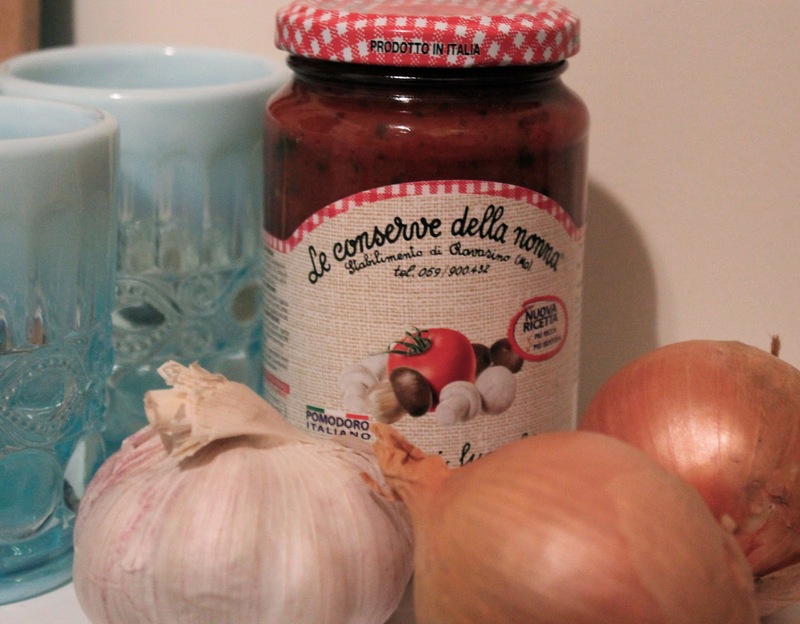 I usually use regular pasta sauce. After a while, the greens taste normal and the pasta tastes heavy. Enjoy! It's a great alternative that I can't believe took me so long to figure out. I wish I had been doing this forever, my buns would definitely be a size smaller! Thanks for commenting! Oh! That sounds delicious! I think I might have to give it a try this week! Try it! Try it! Try it! I even made Seb a bowl and he inhaled it. It's dude-approved which means it doesn't taste at all "diety". I hope you love it as much as I do! I was eating a spicy Moroccan galette while reading this post, ha! This recipe looks and sounds delicious- I am looking forward to making it within the next few days. Thanks! Recently, with my similar pasta-crave but not wanting to eat pasta, I've bought gluten-free corn pasta, which I usually eat with a guacamole sauce, topped with cilantro. I'm off to make a Thai curry dish with rice noodles (another pasta-avoiding meal!). That said, I'm not that thin, but I don't gain weight either. Hmmmm Moroccan galettes. Nom Nom Nom!!! I hope you enjoy it, please let me know how it turns out!! Happy Sunday! Great tip! i have been doing something similar. Usually whatever we have leftover from the night before (usually something soupy/saucey which I like better than dressing) I just heat up in the microwave and throw it over some lettuce. It seems more substantial than a plain salad, plus it is warm so it feels more like a meal too. Eat your heart out Rachel Khoo! Must try this.....when I can get to the shops that isLOL! Snowed in! Snowed in! Lucky gal! I'd love to be snowed in! I want one more storm here in Paris but I don't think it's going to happen...oh well, until next year. LOL. I came up w/a pasta replacement meal rhis winter, too.... I make a rich, hearty pesto. Its heartier than my summer recipe because I add a large bunch of spinach!!! Instead of serving on pasta, I put it on cod filets. Tricks the teen into loving fish while also making sure she gets her favorite dish while I don't run into thise carbs! Ooooh served on fish! That sounds delicious! I like anything smothered in pesto! It's so sort of my kryptonite. Great idea, Sylvia! Thank you!! This is such a good idea! I never would have thought of it. I'm definitely going to be trying this soon! Hi Meredith! Give a try! 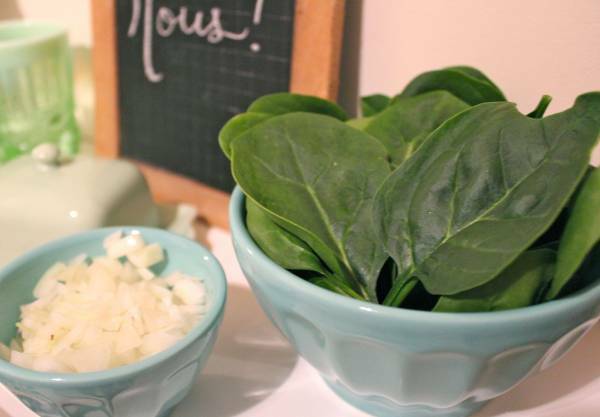 It's super simple and quick when using the pre-packaged spinach. Enjoy! Ive also heard of using an unrolled leak as the pasta sheets in lasagne - maybe worth a try too? This looks good too. I need a deep dish pan to make lasagnas and such, but once I have one, I'll start experimenting! Thank you Felicity! Wow. That sounds awesome. I'll definitely try that soon. I love spinach. Yum! This sounds delicious. 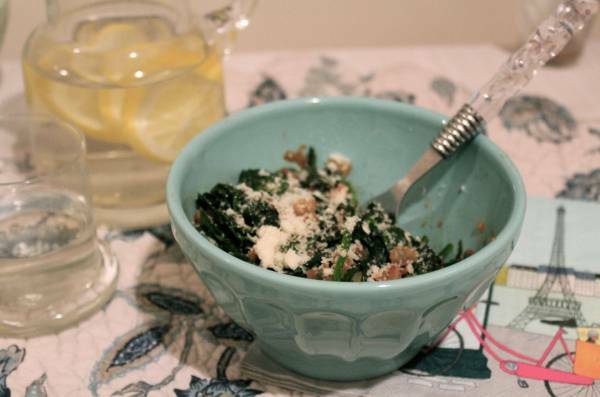 Even though I frequently add spinach to my sauce, I've never had the brilliant idea of going carb free. You're so clever! I can't wait to see how you reduce the calories in raclette! This recipe is really easy to me. I will try this at weekended. I like Italian culture, tradition, Italian food etc . I have taken various courses to learn Italian language and now i can speak fluently. Last summer I have visited Italy as well as I have visited Italian restaurant.I have enjoyed Italian food very much. A year late, I know, but I make fake "lasagne" by using sliced eggplant. You can put spinach and mushrooms in between the eggplant layers as well. I alternate the vegetables with arrabbiata, cover with foil, bake at 200C for about 45-60 minutes (depends on oven) and wolf down. I use an eggplant per serving. The only secret is using a very flavorful sauce, since the veggies won't really give it much zing.